In another article, this site explores some innovations in architecture with the interesting developments we see with the spread of virtual reality (VR). These developments have the potential to alter and improve an entire industry. Yet they represent only some of the numerous ways in which VR, art, and design intersect. For instance, VR proves to be a very exciting technology as it relates to visual art. Painters, sculptors, and digital designers are already finding unique and interesting ways to work with VR to achieve amazing designs. Strictly speaking, we might say any design for VR is “digital.” However, the inference here is that art and design are created on an electronic device. For example, think about high-end mobile tablets and the pens that they use. The tablet pen gives the operator the ability to design graphics in a way that feels more like using non-electronic, traditional art tools. VR can basically elevate this whole concept to a higher level. One useful ability is that in a virtual realm, the object is able to enlarge or reduce to order for the artist to perfect the design down to the smallest detail. This is useful in everything from crafting logos to setting up web pages to the interior design of your home or office. One of the most under-rated aspects of VR is that it can build communal spaces, rather than simply gaming environments. Online casinos illustrate this concept well. Traditionally, they use deposit bonuses and loyalty schemes to attract players, and vibrant, rewarding games to keep them playing. However, they also rely on immersion and realistic settings, which can best be made via VR. People will soon play the same online games but do so while they simultaneously explore virtual casino floors. We may similarly see other kinds of video game arcades coming to life in VR. These games might include entertainment parks with of putt-putt golf, go-carts, and batting cages. The idea is simply that the entire venue, rather than isolated games, is simulated. So why not create virtual studios? There’s a very real opportunity for VR to allow visual artists to create and customize their own digital studio spaces. Sculpting goes hand-in-hand with the art studio idea. 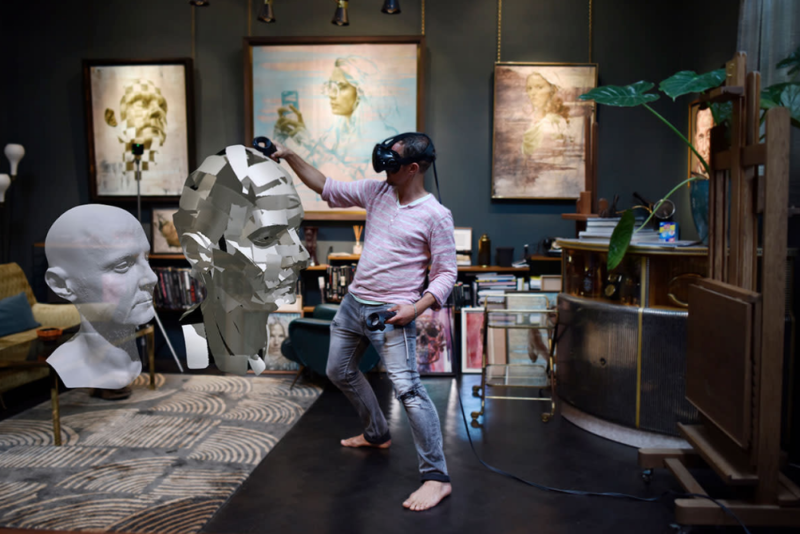 Aside from studios though, sculpting in virtual reality along with 3D printers is an exciting development for sculptors. Mashable highlights an example of a sculpture that was made in VR in 2017. The detail of the design and quality of the sculpture are amazing! This remarkable design indicates that there is a lot of potential for the creation of life-sized, remarkable sculptures through virtual programs. All in all, it’s a whole new wonderful world for artists!